A black and white photograph of 405 Dundas Street West. In 1958, the Town of Whitby purchased property from Samuel Trees to construct a new, larger municipal building to replace the aging Town Hall located at Brock and Colborne Streets. 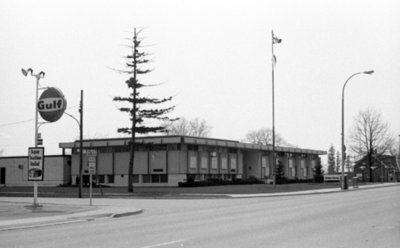 The Municipal Building was officially opened in 1960 and served as Whitby’s administrative hub until 1977 when offices were moved to the buildings located at 575 Rossland Road East. With Whitby Town Council and Staff in their new location, the Whitby Public Library moved into the Municipal Building that same year. Eventually, the Library and its collections outgrew the space at the old Municipal Building and plans were set in motion to construct a purpose built library to house larger collections, improved technology, comfortable spaces, and community meeting rooms to accommodate Whitby’s increasing population. Built by architects Shore Irwin Tilbe & Partners, construction on the new library began in 2003 around the old library. When the new building was complete in 2006, Celebration Square, an area for community gatherings, took the place of the old Municipal Building. 405 Dundas Street West, April 1976, Brian Winter. Whitby Archives A2013_004_019C. Scanned from original black and white negative.